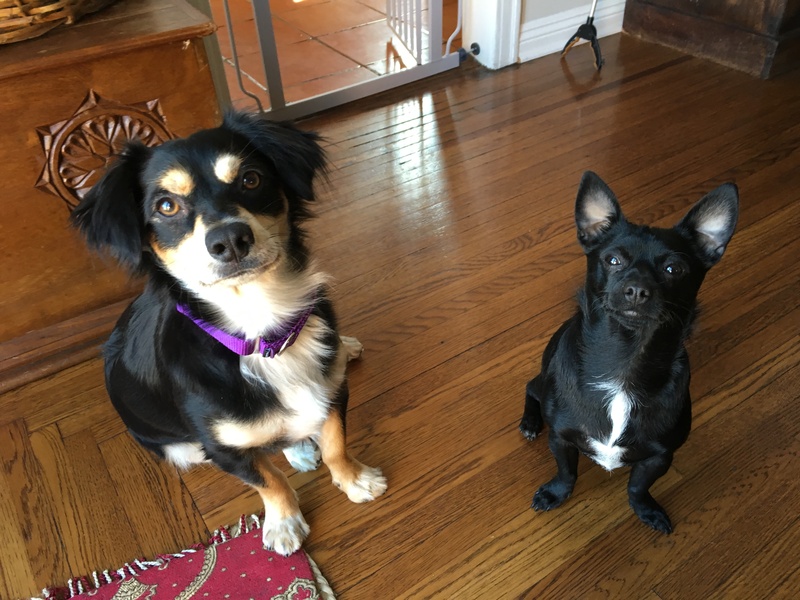 Kobe (left) is a two-year-old Corgi mix in Los Angeles who gets over excited, doesnt recall on command and charges the door when guests arrive. His partner in crime is Luca (right) a one-year-old Jack Russell Chihuaha mix who tries to dominate Kobe. When I arrived for the session, both dogs were excited and their guardian had to grab them to prevent them from running out the door. I discussed the situation with the dog’s guardians (each dog is owned by a different brother) and their father who was gracious enough to host this session. In the course of our discussion I learned that the dogs didn’t have many rules in place. Because dogs probe to test boundaries and determine their rank, this lack of rules and resulted in the dogs thinking they had the same status as the humans. I suggested some rules and showed the guardians how to enforce them when the dogs crossed the line. Providing timely corrections is an important component of a healthy leader follower dynamic. I explained how dogs learn so that he guardians could understand how important the timing of a reward or correction is. The flip side of rules and boundaries are rewards and affection. Because a dog assumes that our attention or affection is tied to whatever they are doing at the time we pet them, I went over a technique I like to call Petting with a Purpose. By consistently asking the dogs to do something, then rewarding them with attention or affection after they comply, the guardians can help the dogs practice basic obedience while also teaching them that rewards come when they listen. Next I went over some non verbal communication cues to use when the dogs do something they shouldn’t or cross a boundary. Because “No” is the 51st most commonly used word in the English Language, many dogs learn to ignore it as its only for them around 25% of the time. I suggested they use a hissing sound like a cat instead of saying “no,” “don’t do that,” or “don’t even think about doing that.” This sound resonates with dogs as a hissing sound is the warning given by many animals a dog interacts with. I also went over some Escalating Consequences to use if the hiss sound doesn’t do the trick. By consistently using the hiss and subsequent Escalating Consequences, the dogs will immediately understand what the humans want from them. Ensuring that everyone is on the same page is a big part of correcting unwanted dog behaviors. After practicing an exercise that helps the humans use these new communication cues and assists the dogs in developing better self control, we were ready to tackle their behavior at the door. I had Luca’s guardian head out to play the part of a guest so I could demonstrate the technique the first time. By first claiming the door and addressing the dogs before opening it, I was better able to control the situation. Once the dogs saw that I had the situation under control, it was easier for them to lay back and let me handle it. I gave Kobe’s guardian a few additional pointers then had Luca’s guardian head out to play the scene again. Only this time, Kobe’s guardian was the one who answered the door. At first Kobe’s guardian’s slower movements that went sideways or stopped short of the dog didn’t get him the results he was looking for. But he stuck with it and after a few additional pointers was getting a better response from both dogs. It will be important that he starts moving quicker and more deliberately at the dog the instant either dog crosses the boundary in the slightest. Once the timing is faster, the guardians will be able to interrupt and disagree the same time or just as the dog gets started. Disagreeing with a dog early is extremely helpful with this exercise. By the time we wrapped up the session, both dogs were noticeably calmer, were looking to the humans for guidance and already starting to respect the new rules we only put in place a few hours ago. I expect both dogs to push back a bit when the guardians enforce the new structure, but this should only last a few days. Once the dogs identify the guardian as being their leader, it will be a snap to stop any remaining unwanted behaviors.